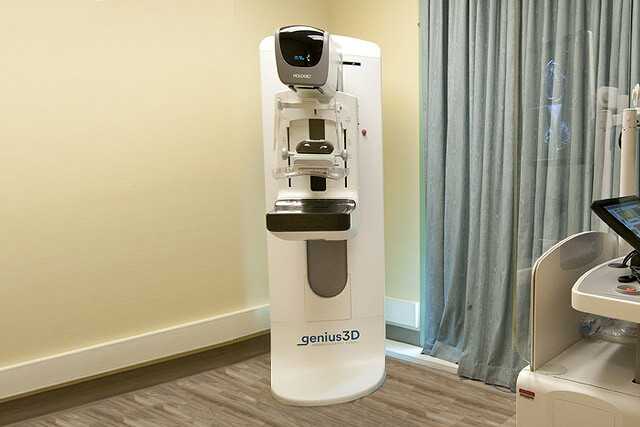 Manatee Memorial Breast Care Center is the first in Manatee and Sarasota Counties to offer the Hologic® Genius Clarity HD high-resolution 3D™ Mammography Imaging technology with the new SmartCurve™ breast stabilization system. The new imaging technology is designed to deliver a more comfortable mammogram, without compromising image quality. **Data on file and from public sources, 2017, Hologic, Inc. The Breast Care Center at Manatee Memorial Hospital has highly trained female staff, registered mammography technologists and interpreting radiologists, and all our equipment is accredited by the American College of Radiology (ACR) and certified by the Food and Drug Administration. Computer Aided Detection (CAD) – This technology provides a "second read" of mammograms by a computer, assisting the radiologist in making an accurate diagnosis. Breast Ultrasound – Ultrasonic imaging is a noninvasive medical test that can produce an image of the internal structures of the breast to help physicians diagnose and treat medical conditions. Breast MRI – This can be used to screen women who are at an increased risk of breast cancer and can detect additional areas of breast cancer in women who have newly diagnosed breast cancer. MRI can also be used as a problem-solving tool if there is suspicion of an abnormality that cannot be fully evaluated by mammography and ultrasound. Affirm® Breast Biopsy Guidance System – This system allows the patient to remain upright while providing 3D image-guidance to the lesion. Stereotactic Breast Biopsy Technology – This breast biopsy system lets the patient lie down for access to hard-to-reach lesions and calcifications. The breast cancer support group is for patients who are newly diagnosed, who are currently in treatment or have completed treatment. Families and caregivers are welcome.